SAN FRANCISCO—Even those supervisors who enjoy a soda from time to time were willing to put their weight behind a proposed state tax on sweetened beverages to raise funds for childhood obesity prevention programs. The San Francisco Board of Supervisors unanimously passed a resolution Tuesday urging Sacramento to pass SB-622, which would impose a tax of one cent per fluid ounce on drinks containing caloric sweeteners sold in the state. The tax would apply to any beverage, like energy drinks, fruit punch, and sweetened tea that has more than 25 calories per 12 ounces. For example, the tax would add 12 cents to every can of soda. The expected annual revenue of $1.7 billion would to go a newly created Children’s Health Promotion Fund, set up to sponsor health programs for children, for the prevention and treatment of obesity and diabetes. Cohen said she supports the soda tax, but also said that San Francisco needs to ensure it will get its fair share of the tax revenue, and that the funds will truly be used for children’s programs. According to the Centers for Disease Control, 12.5 million children and teenagers are obese nationwide, and 62 percent of teenagers drink at least one sweetened drink every day. SB-622, introduced by Senator Bill Monning (D-Carmel), has passed in both the Senate Committee on Health and the Senate Governance and Finance Committee, along party lines with Democrats in favor. “We’re in the midst of a public health crisis fueled by childhood obesity,” Monning said to the Senate Committee on Health early May, according to CaliforniaHealthline. “This legislation sets an alternative path toward health and wellness,” he added. Next week, as the last hurdle before going to the full Senate floor, the Appropriations Committee will vote on it. Due to the Democrats’ supermajority, observers expect the bill to pass. The Center for Consumer Freedom, a food industry group, has opposed the bill. J. Justin Wilson, senior research analyst with the group, called it “nothing more than a money making exercise for California’s cash-strapped government,” according to a statement. 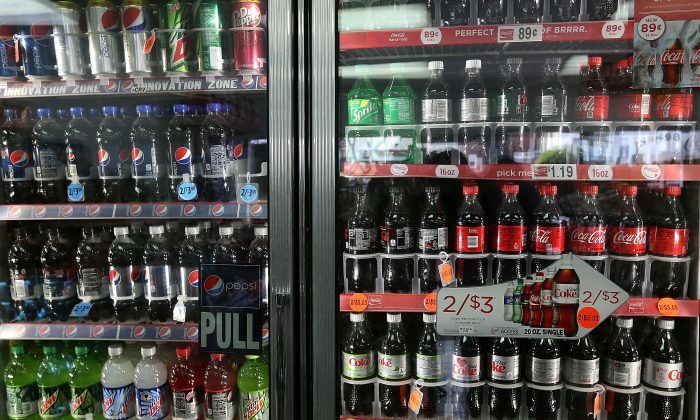 A poll by California Endowment, released in February, showed that 68 percent of California voters would support a soda tax if the revenue were used to improve school nutrition and physical activity programs. In the same poll, voters disapproved of a tax if the revenue would go to the general fund. A soda tax initiative in Richmond failed to win a majority of voters in November last year, with only 33 percent in favor. The impetus for the large sugary drink ban, or soda ban, was fighting “the obesity epidemic,” according to Mayor Michael Bloomberg and his health officials.